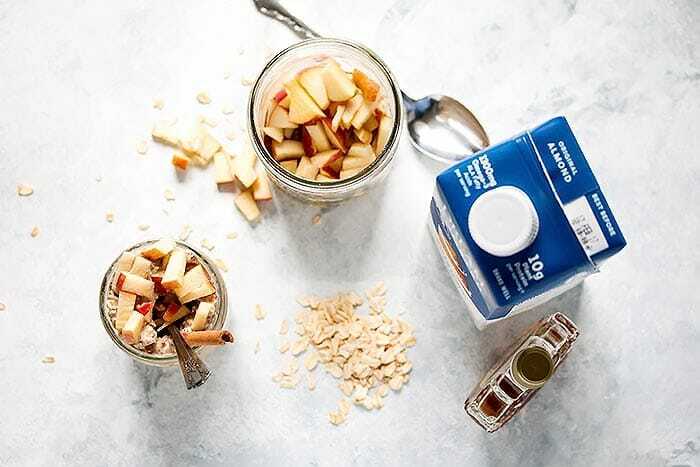 Easy overnight oats with apples and apple sauce, cinnamon, chia seeds, maple syrup, and the protein and vitamins added by Dream Boosted Almond milk. This post is sponsored by Almond Dream. All opinions are ours. It’s about time I tried making these super easy overnight oats! I have been meaning to try them for quite some time now, but had never got around to it. Now that I have, I can’t believe I waited so long. 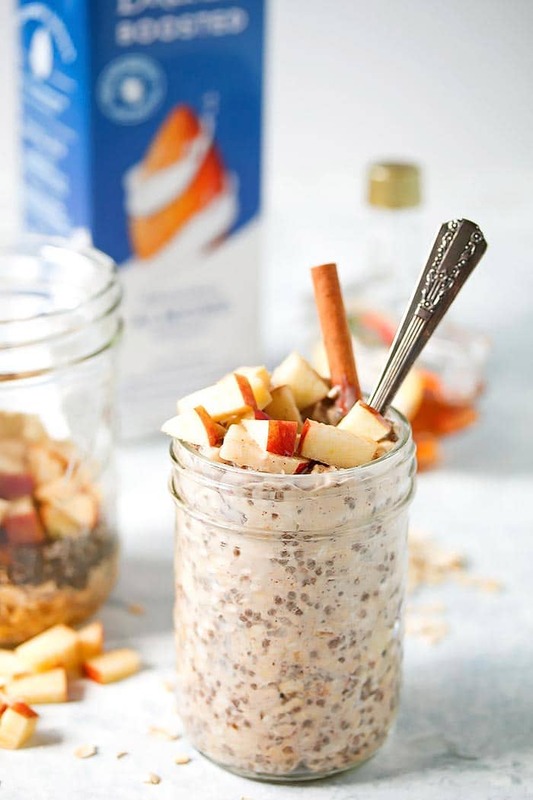 Especially for these overnight oats with apples, cinnamon, chia, and Dream Boosted Almond. I have been on a mission lately to try to get my man to eat a healthy breakfast instead of going to Mc D’s or Tim Hortons every morning and I have actually been making some progress since he has FINALLY asked me to make him smoothies in the morning, which I am more than happy to do. However, he works hard and a smoothie only goes so far. He needs something else that’s quick for me to make, for him to grab and go, and is nutritious as well as tasty. 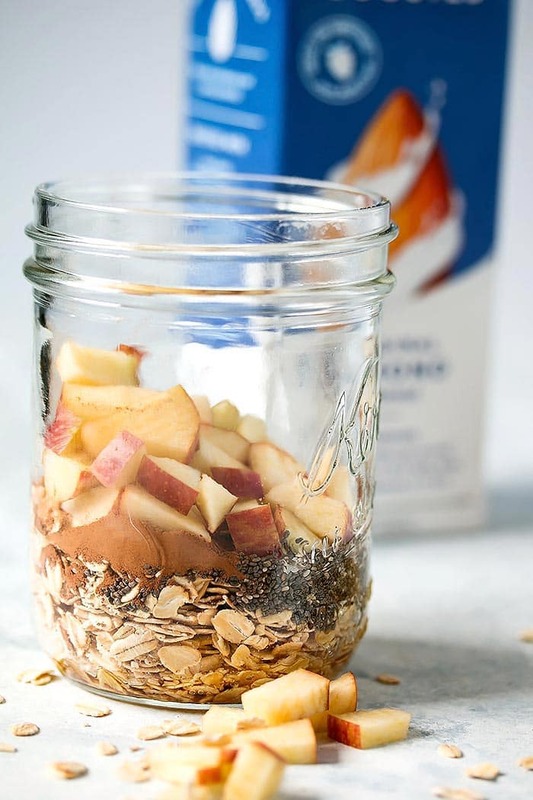 I thought these super easy overnight oats might be the answer. I think the main reason I have avoided overnight oats until now is that I don’t eat a big meal for breakfast, there isn’t enough protein in the oats themselves and I hate protein powder with oatmeal. Dream Boosted Almond solves this problem in the best way possible! 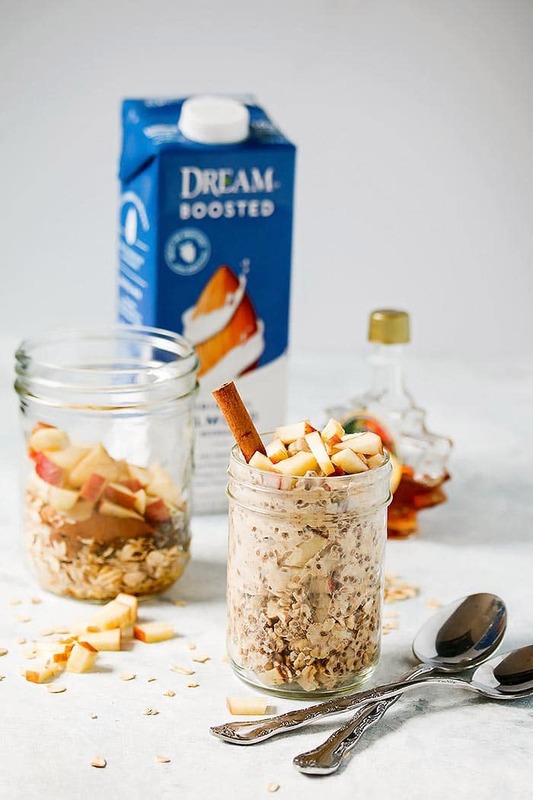 There is 10 grams of protein per serving in Dream Boosted Almond so when you make easy overnight oats with it, you get a nice serving of protein for breakfast. Not only that, the protein in Dream Boosted Almond is plant protein and there is no gritty or thick texture. That is super important to me. I will eat or drink things that don’t taste totally awesome just because they are very healthy, however Kevin won’t. And frankly, I can’t blame him. 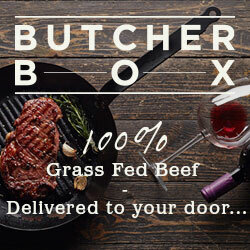 I prefer my food to taste delicious as well as being healthy too. Dream has a number of wonderful products. There are two flavors of Dream Boosted, almond and coconut. The almond flavor is made with real Californian almonds. Both have 10 grams of plant protein included as well as omega-3 fatty acids, camu camu, flax and chia seeds, and vitamins A, C and E. The Dream Ultimate Almond has 4 times the amount of almonds as in regular almond milk and has 5 grams of protein. It comes in original, vanilla, and unsweetened. Dream also has a number of rice, soy, and cashew milks in their roster. Lots of choices for whatever your preference might be. 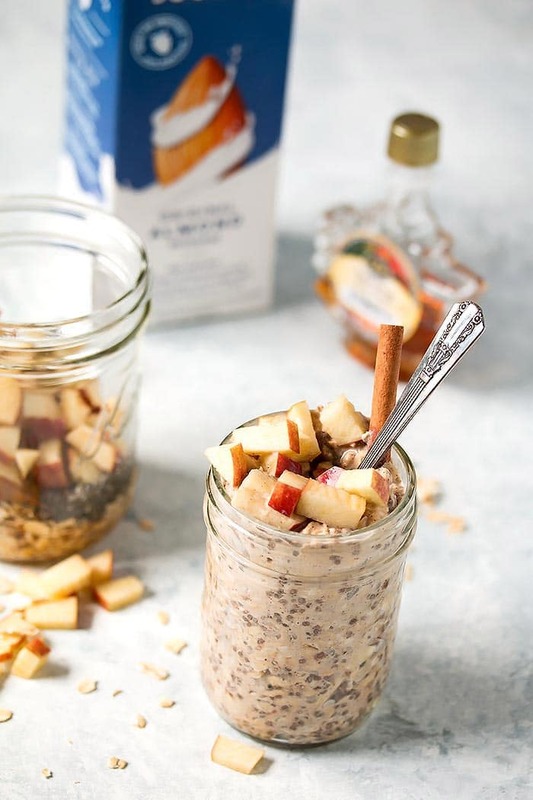 I chose to make apple cinnamon chia overnight oats because apple anything is a favorite in our family, but the flavour possibilities are endless with overnight oats. I have to say tho, the apple cinnamon was a hit and no one said a word about the chia I added for a little extra nutrition. 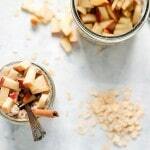 I saw a number of recipes on Pinterest that cooked the apples first before making these easy overnight oats. Not only is that more time consuming, most of those recipes added sugar to the apples and I really wanted to avoid that. This recipe has a little maple syrup for a touch of sweetness, but honey would also be a great option. Besides, I found that I really liked the tiny crunch that the chopped apples retained after siting in the fridge overnight with the oats. 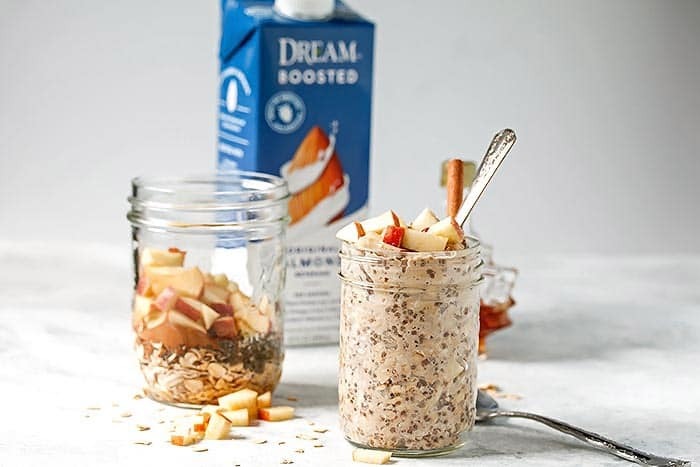 In addition to making these easy overnight oats with Boosted for Kevin’s breakfast, I am also going to start using Dream Boosted Almond in his smoothies in the morning in place of the vanilla yogurt I usually use. I put a little protein powder in his smoothies already but getting rid of the dairy all together in his smoothies is another step in the right direction for a nutritious and delicious breakfast. If you are looking for a dairy free milk alternative for your breakfast dishes, I highly recommend giving Dream Boosted Almond a try. It’s passed all my tests with flying colors! Visit www.DreamPlantBased.com to find a coupon that you can use at Whole Foods, and soon at Sprouts, in both the refrigerated and shelf stable sections. Add all the ingredients to a mason jar with a lid. Shake well and put into the fridge for 6 hours to overnight. When you are ready to eat them, take them out of the fridge, give them a good stir.